Property Location With a stay at Flatiron Hotel in New York (Chelsea), you&apos;ll be minutes from Madison Square Park and The Institute of Culinary Education. This 4-star hotel is close to Empire State Building and Macy&apos;s.Rooms Make yourself at home in one of the 64 air-conditioned rooms featuring iPod docking stations and minibars. Wired and wireless Internet access is complimentary, while 37-inch flat-screen televisions with cable programming provide entertainment. Private bathrooms have designer toiletries and complimentary toiletries. Conveniences include laptop-compatible safes and desks.Rec, Spa, Premium Amenities Make use of convenient amenities such as complimentary wireless Internet access, a television in the lobby, and complimentary use of a nearby fitness facility.Dining Enjoy a satisfying meal at a restaurant serving guests of Flatiron Hotel. Quench your thirst with your favorite drink at a bar/lounge.Business, Other Amenities Featured amenities include a 24-hour business center, limo/town car service, and a computer station. Event facilities at this hotel consist of a conference center and a meeting room. 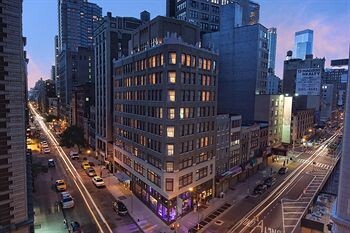 The Flatiron Hotel is a hotel..
Descriptionclass="small" style="text-align: justify; font-size:11px;">Property Location With a stay at Flatiron Hotel in New York (Chelsea), you&apos;ll be minutes from Madison Square Park and The Institute of Culinary Education. This 4-star hotel is close to Empire State Building and Macy&apos;s.Rooms Make yourself at home in one of the 64 air-conditioned rooms featuring iPod docking stations and minibars. Wired and wireless Internet access is complimentary, while 37-inch flat-screen televisions with cable programming provide entertainment. Private bathrooms have designer toiletries and complimentary toiletries. Conveniences include laptop-compatible safes and desks.Rec, Spa, Premium Amenities Make use of convenient amenities such as complimentary wireless Internet access, a television in the lobby, and complimentary use of a nearby fitness facility.Dining Enjoy a satisfying meal at a restaurant serving guests of Flatiron Hotel. Quench your thirst with your favorite drink at a bar/lounge.Business, Other Amenities Featured amenities include a 24-hour business center, limo/town car service, and a computer station. Event facilities at this hotel consist of a conference center and a meeting room. not a 4 stars hotel maybe 2. the staff not friendly the breakfast itâ€™s like a snack. so expensive for the experience. Never i paid more for booking after the reservation i paid $30.00 more for my reservation at the moment of check in. At the check out they charge me extra $133.00 for towels and sheets because they canâ€™t wash and they threw them in the trash because its so dirty my friend and i wants to saw the sheets and the towels.. So embarrassing the situation with the manager she was very rude.. I used frequency booking for international stays and locals stays in really 4 & 5 stars hotels.likes Hotel Atlantico in Madrid, Condado Vanderbilt in Puerto Rico etc. for say some goods hotels..the customers experience was awful in my stay in Flatiron hotel.